Tarpon fishing in the clear, aqua waters of the Gulf of Mexico beaches is a sight fisherman’s delight from May through July. Tarpon that will average 80 to 90 pounds and frequently go up to 150 pounds or more are jumped or landed daily during the season on both fly or spinning tackle. This is true big game fishing. It requires patience and stamina to stalk and land these big fish and few types of fishing can rival the experience or the reward of first spotting your fish, then delivering an artificial bait that fools him. Many times you can actually watch the giant silver king roll up and take the bait. The adrenaline runs high as angler and fish prepare to lock up in a dynamic battle of wills. Cliff Ondercin, from Sarasota, FL, and his dad, Dennis Ondercin, from OH, had great action jumping numerous tarpon and landing several on DOA Baitbusters and live baits while fishing the coastal gulf in Sarasota with Capt. Rick Grassett last week. These fish generally explode from the water like shining missiles as they try to shake the hook. 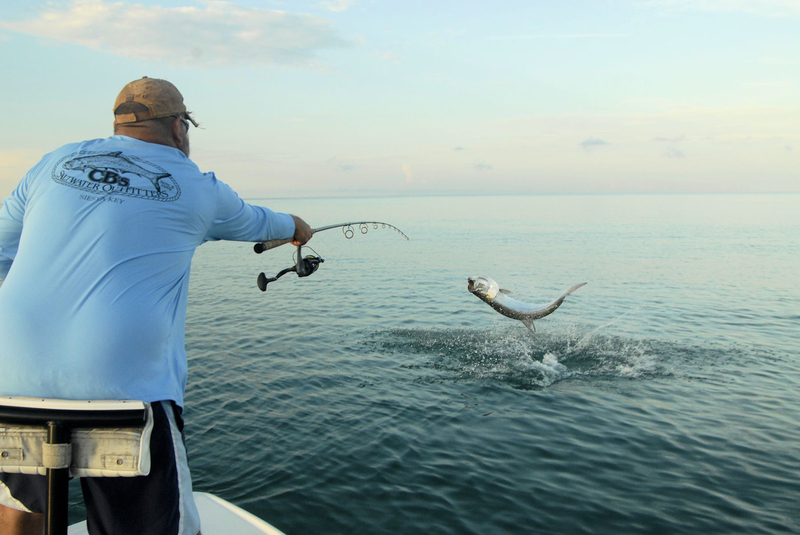 Multiple jumps and tail-walking exhibits of power and determination are the tarpon’s hallmark. There simply is no shallow water fishing experience so impressive or memorable. Even though we are fishing in water from 6 to 25 feet in depth, many of the fish are hooked at or just below the surface. A tarpon trip with spinning tackle begins before daylight in the morning and lasts until early afternoon. 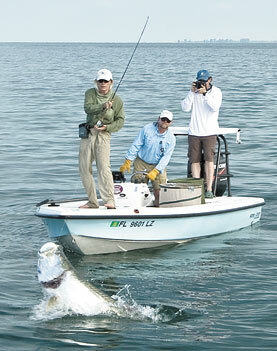 A fly fishing tarpon trip begins later and lasts until mid to late adfternoon. From August through early fall, we fish the canals and backwater areas of upper Charlotte Harbor for juvenile tarpon of 10 to 30 pounds. These fish offer the same type of action as their larger counterparts along the beach – and more! The smaller fish tend to be more acrobatic, but can be landed more quickly due to their size. Fly tackle in the 8 or 9-weight size range or medium spinning tackle is used to target these mini silver kings. But whether large or small you will always be amazed by the show these fantastic fish put on. It only takes a few moments after tangling with a tarpon that you realize why many consider him one of the greatest gamefish in the world.